Power plant 2 775 hp (578 kW) Wright R-1820-33 9-cylinder radial engines driving three-blade variable pitch propellers. 1830 miles (2900 km) ferry. Production 479 by 1936 at Glenn L. Martin Company, Cleveland, OH. Variants The B-10, B-12, and B-14 were minor variations on the basic Model 139. The Model 166 had an improved “greenhouse” canopy. 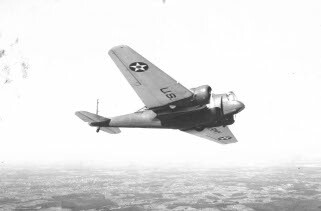 The Martin Bomber was an innovative bomber design when it first entered production in 1936, with such advanced features as cantilevered wings, flaps, all-metal monocoque construction, retractable landing gear, and variable pitch propellers. However, it was hopelessly obsolete by the start of the Pacific War, and most of those still with U.S. forces were converted to target tugs. The Dutch had deployed about 138 in the Netherlands East Indies when war broke out, and they were more successful in combat than they had any right to be.